There can be a similar perception about coaches in sports. “Those that can’t play, coach.” Again, ridiculous. The wealth of knowledge and experience that a talented coach can bring is incalculable. With their watchful and experienced eye, they can help shape an athlete or team into the best they can possibly be. That takes talent! Thankfully, there isn’t a negative perception of coaching in the business world. Large corporations spend millions upon millions of dollars every year paying business coaches to work with their employees. They know that the money they invest in coaching will pay off tenfold, improving the performance of their employees and helping them grow. 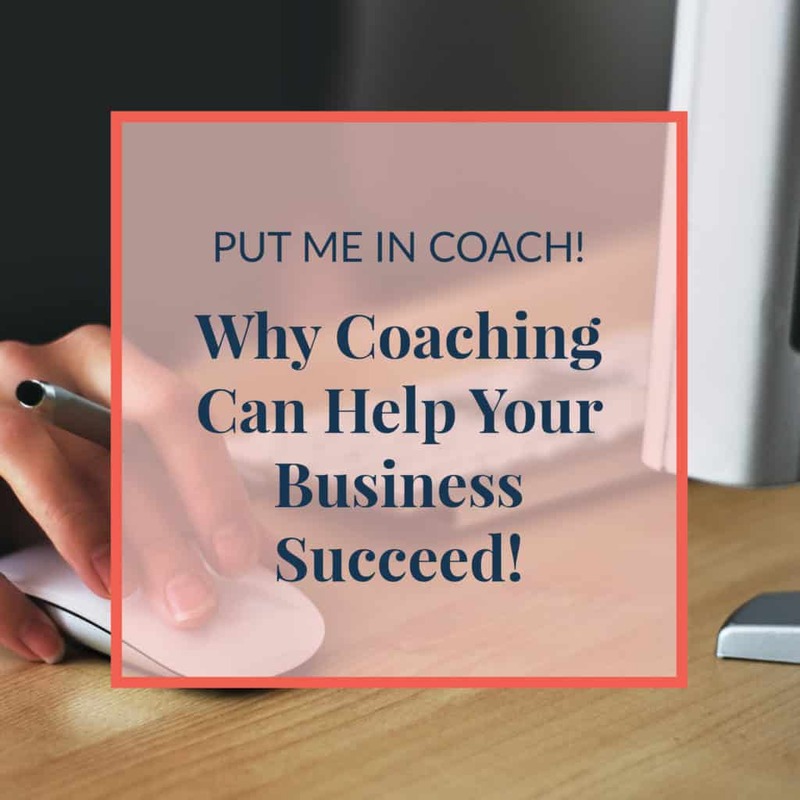 More and more, small business owners and entrepreneurs are also looking to coaches to help them grow their businesses. So, what’s the benefit of hiring a personal business coach for you or your small business? You should never underestimate the power of coaching! Get some help at your small business by hiring me as your business coach! New small business owners often find themselves in over their head for the first year or so. That’s totally understandable! Running your own small business is one of the most time-consuming and stressful endeavors you can take on. Thankfully, small business owners don’t have to do it alone. With the help of an experienced business coach, you can avoid many of the common mistakes that most small businesses make in their early days. A coach can instead guide you to smart decisions that will allow you to grow your business right out of the gate. Trust me, I know that it can be challenging to get over the feeling of “I have to do it alone!” Heck, I feel it too! I’m the owner of a successful small business; I should be able to handle everything myself! Self-reliance for the win! Except that’s silly. Everyone has gaps in their knowledge and experience, but what if you can work with someone who fills those gaps? Well, then you have the inside track to success! And that’s what a coach can give you! Let me paint you a picture. It’s the end of a long, exhausting day at work where everything went wrong. You’re stressed, you’re tired, and you just want to go veg on the couch with a bowl of popcorn and Netflix. But you have a big problem; there’s a task in your project management system that you couldn’t get finished. It’s due tomorrow, so you need to get it done tonight or it will be a massive headache for you in the morning. Here is the problem. In the state I described (exhausted, burnt out, frustrated), you’re in no state to hold yourself accountable. Many small business owners would throw up their hands and say, “I’ll do it tomorrow, it’s fine!” What you need is a “boss.” Someone who will hold you accountable to get everything finished. But you’re the boss! So, who holds you accountable? One of my most popular coaching services is accountability calls. Here, we schedule a call once every single week where we plan out tasks and actions steps that will help in the growth of your business. Then, the following week, I will check up on you to see if those tasks are complete. In other words, I will hold you accountable for your work. The results that many of my clients have been seeing from this service is remarkable. Once you have someone holding you directly accountable, you feel driven to get everything done, even though you were the one who hired me! Funny how our brains work, isn’t it? Having a business coach can take some of the pressure off your back, giving you the support and advice you need to grow your business. There are times when you may want to expand on specific aspects of your business, but you don’t have the experience to do it alone. For example, creating a digital marketing strategy. Content drives digital marketing. With content, you have something to give your customers for free, boosting goodwill and showing them what you have to offer. One of the best pieces of content that you can create for digital marketing purposes is a blog. While many clients come to me to write a weekly blog for them, there are others who want to do it themselves. They want to write a blog every single week and get it published online. And that’s terrific! The problem is they seem to get stuck! That’s where my consultation services come in. If you wanted to write your own blog, but didn’t really know how to get started, I would be happy to help. I can walk you through all of the steps that go into writing a blog, from creating an editorial calendar, to initial research, to writing, to proofreading, to posting it on your website. Having someone teach you every step can be incredibly helpful, giving you the jumpstart you need to introduce new features and services at your business. One of the best things about a business coach is that it’s a low-pressure relationship. Let’s say that you decide to do some coaching with me. Well, there are no long-term contracts to sign or agreements to be made. There aren’t any insane consulting fees or hidden charges. You are only paying for the time that we spend talking together. I love coaching small business owners and entrepreneurs because I’m one of them! Helping people go after their dreams makes me happy! If you think there are any areas of your business where I might be able to give you a hand, or even if you want me take on something, please feel free to contact me today. Believe me, becoming your business coach would be an honor that I’d readily accept! If you still not sure that utilizing a virtual assistant is for you, check out my free workbook. In it, I will tell you exactly what you want to look for from a virtual assistant to make sure you pick the best to work at your small business.